No matter the occasion you will sweep her off her feet when you send this magnificent display! 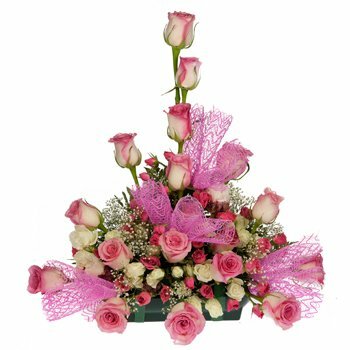 Our experts have collected the most beautiful roses in the world and built a stunning arrangement perfect for the centerpiece at a wedding or to show your love to someone special. Dozens of large pink and white roses grow into a tower from a cloud of stunning pink and white miniature roses and are complemented with hints of baby's breath and pink lace. For weddings, anniversaries, and even perfect for Mother's Day, your loved one will thank you when you send the Rose Explosion Centerpiece.